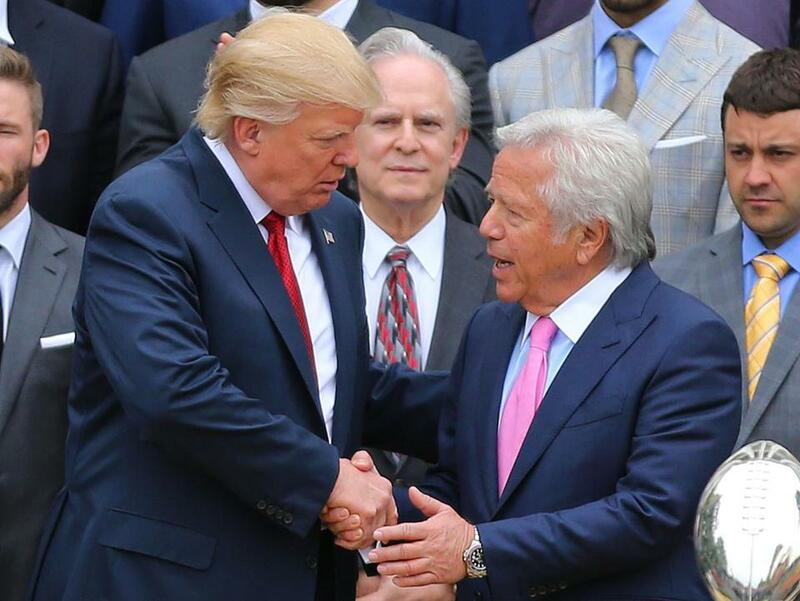 President Trump congratulated Robert Kraft at the White House after the Patriots won the Super Bowl in 2017. Host Brian Kilmeade noted that Trump tweeted out a congratulatory message to the Patriots after they defeated the Kansas City Chiefs in the AFC title game and asked Kraft how it feels to have the support of the commander-in-chief heading into the Super Bowl. Trump counts Kraft, head coach Bill Belichick and quarterback Tom Brady among his friends. Earlier in the interview, Kilmeade asked Kraft about the high playoff ratings, and the team owner referenced the partial federal government shutdown that recently ended. Kilmeade also asked Kraft if the president had offered him any advice. Kilmeade later pivoted to Murdoch, noting Kraft’s prior praise for the 87-year-old media titan. “He’s one of the most outstanding human beings on the planet,” Kraft said during his Friday appearance on Fox News, a Murdoch property.